 Peterson’s Algorithm is a simple algorithm that can be run by two processes to ensure mutual exclusion for one resource.  It does not require any special hardware.  It uses busy waiting technique.  Peterson's Solution is a concurrent programming algorithm for mutual exclusion that allows two or more processes to share a single-use resource without conflict, using only shared memory for communication.  The algorithm uses two variables, flag and turn.  The variable turn indicates whose turn it is to enter the critical section.  If turn == i, then process Pi is allowed. 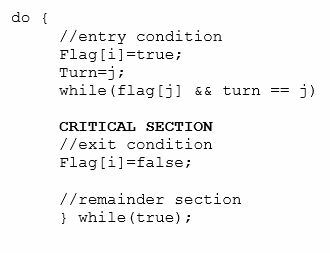  The flag array is used to indicate if a process is ready to enter the critical section.  Flag[i] = true implies that process Pi is ready.